The yellow and orange sunset colors filter through the darker clouds and reflect off Lake Audy in Riding Mountain National Park in Manitoba, Canada as a woman canoeing slowly paddles by. The scenery surrounding this canoeist is one which is breathtaking as Lake Audy is bordered by boreal forest giving visitors plenty of areas to explore while canoeing the lake. Lake Audy is filled with outdoor recreation such as fishing, boating, swimming and canoeing all which can be done within steps of your campsite. The campground is situated along the waters edge with self-registration, well water, a campfire circle, kitchen shelters and trails. Opened from the middle of May until the middle of October, the Lake Audy Campground is a picturesque place to spend a vacation. 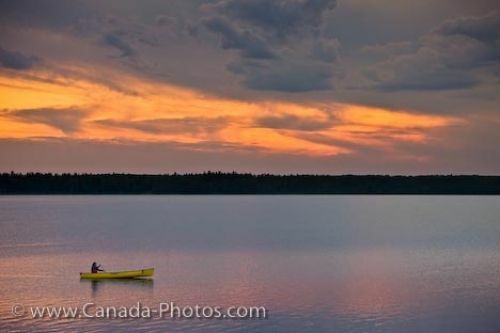 Picture of a woman canoeing and enjoying the tranquility and scenery of Lake Audy in Manitoba, Canada at sunset. Lake Audy has become a well known location for campers, canoeists, nature lovers and photographers as the scenery is stunning and a sunset can highlight the sky in various hues.